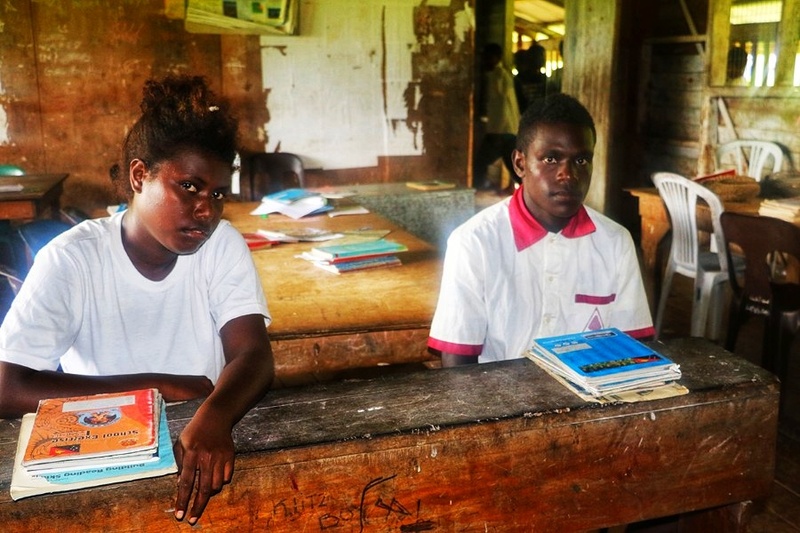 Current and future students in Bougainville’s Peit Constituency are set to benefit from new school facilities which will promote improved education opportunities for the community. Gagan Primary School on Buka Island has received a new double classroom and teachers’ housing, which were officially opened yesterday as part of the Papua New Guinea – Australia Partnership. The school has played a role in the education of some of Bougainville’s most prominent individuals, including Josephine Getsi, Bougainville’s Minister for Community Development and Member for Peit, and the late Dr Alexis Sarei, former Papua New Guinean High Commissioner to the United Kingdom and North Solomons Premier. Evangelyn Ratsi and Ferdinand Rohen (pictured below) are the head students at Gagan Primary and are certain that their studies will benefit from the new classrooms. 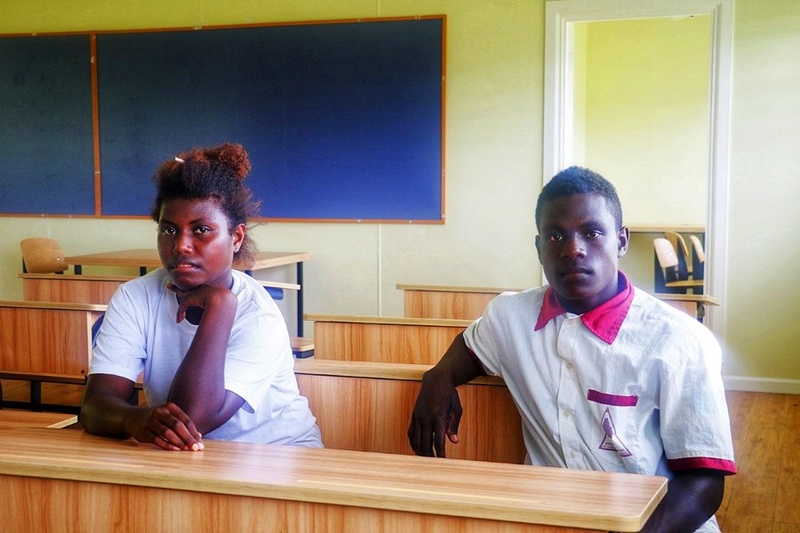 The two students are working hard to achieve their own goals, continuing the school’s tradition of education and aspiration - Evangelyn wants to be a doctor one day and Ferdinand aims to become a pilot. Gagan Primary is one of 18 schools across Bougainville, including in remote atoll communities, which will benefit from the construction of new learning infrastructure. More than 1,200 new primary school places will be created when the works are completed. The construction of new school infrastructure is part of Australia’s commitment to quality education for children across Papua New Guinea. “It is commendable that Pacific governments are stepping up their infrastructure investments, for example, in renewable energy to help reduce electricity costs and progress towards ambitious international climate change commitments,” said ADB Director General for the Pacific Ms Carmela Locsin. Economic prospects for the Pacific remain positive, but growth will remain slow compared to other subregions, according to the report. For 2018, growth in the Pacific is expected to remain flat at 2.2%. This is partly due to the impacts of disasters including an earthquake in Papua New Guinea (PNG) and Cyclone Gita in Tonga last February. Economic recovery in PNG and rising investment in Timor-Leste are expected to push growth in the Pacific to 3.0% in 2019. The monitor, the flagship economic publication of ADB’s Pacific Department, focuses on country issues and current policy themes. The latest issue focuses on the developments in the utilities sector, particularly electricity. Access to electricity is low in the Pacific, particularly in the more remote and less developed parts of the subregion. This is due to the countries’ dependence on expensive fossil fuels for power generation, inadequate investment in infrastructure, and electricity services costs that can be beyond the means of rural households. About 20% of PNG’s population, for instance, has access to electricity and that number falls to 13% in rural areas, according to the report. Without access to electricity, public services cannot be properly delivered, and business activity is constrained—resulting in unfulfilled economic growth potential. Although PNG has enviable potential to produce power, significant investment in the sector is needed to reach the country’s goal of 70% electrification by 2030. The Monitor looks at how diversifying energy sources can help to lower costs by reducing dependency on expensive diesel, and how improved regulation can help attract much-needed investment and expand consumer access to electricity. The monitor includes a series of short articles on efforts to improve electricity access in the Solomon Islands and Vanuatu; initiatives to bring innovation and international best practice to Fiji’s electricity sector; renewable energy initiatives in the Cook Islands, Samoa, and Tonga; and strategies for improving energy access in Kiribati, Nauru, and Tuvalu. The report also includes a cautionary piece on cryptocurrencies in the North Pacific, as well as an article discussing measures for increasing competitiveness in Timor-Leste. ADB is working with development partners to provide greater support to help Pacific utilities modernise their business systems and eventually become financially self-sustaining, and effect change in utility sector policies and governance arrangements. The report noted that long-term partnerships with utilities beyond project implementation is vital to bring about genuine, transformational change. PEM is a bi-annual review of economic developments and policy issues in ADB’s 14 developing member countries in the Pacific and includes policy briefs on key policy issues and interests. In combination with the Asian Development Outlook series, ADB provides quarterly reports on economic trends and policy developments in the Pacific. The Monitor welcomes contributions of policy briefs from external authors and institutions. ADB, based in Manila, is dedicated to reducing poverty in Asia and the Pacific through inclusive economic growth, environmentally sustainable growth, and regional integration. Established in 1966, it is owned by 67 members—48 from the region. In 2017, ADB operations totaled $32.2 billion, including $11.9 billion in cofinancing. 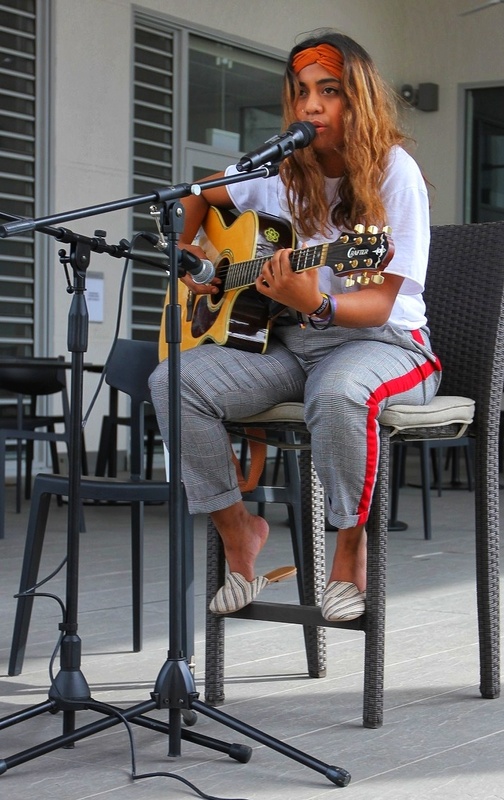 Award-winning Indigenous Australian singer-song writer, Emily Wurramara, is in Papua New Guinea as part of theNational Aborigines and Islanders Day Observance Committee (NAIDOC) week celebrations hosted by the Australian High Commission. Emily Wurramara performing at the Australian High Commission on Monday 16 July. Emily Wurramara with Australian High Commission staff members after her performance. Emily, 22, from Groote Eylandt in the Northern Territory is passionate about her rich cultural heritage, which is reflected through her music. She started writing music at nine years-old and continues to create songs in both English and Anindilyakwa, the language of her home. She has taken her music around the world, with shows and festival appearances in countries such as Sweden and France. Emily has just released her first album in Australia, entitled ‘Milyakburra’. Emily will be collaborating with top performing Papua New Guinea artist, Mereani Masani. NAIDOC week is celebrated in Australia from the first Sunday in July to honour the history, culture and achievements of Aboriginal and Torres Strait Islander peoples. Papua New Guineans joined local and international APEC experts on Thursday for a dialogue on the importance of hosting the region’s premier economic forum. The event – themed ‘Why APEC matters for PNG?’ – was part of the APEC Discussion Series at the Precinct and included a keynote address from Carlos Kuriyama, senior analyst at the APEC Secretariat in Singapore. 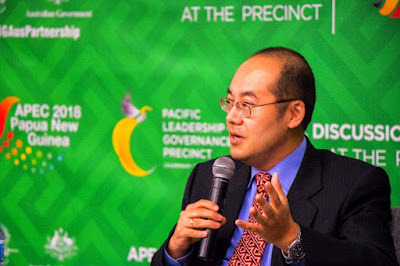 Keynote speaker Carlos Kuriyama, senior analyst, APEC Secretariat (Singapore), speaking at the second event of the APEC Discussion Series at the Precinct. Kuriyama spoke on the benefits APEC brought to his home country Peru, where he was previously a government official at the Ministry of Foreign Trade and Tourism and served as chief negotiator of the Peru-China FTA negotiation. The event also included a panel discussion that featured Ken Waller, executive director of the APEC Business Advisory Council, and Lady Aivu Tauvasa, deputy chair of Nambawan Super, who took questions from the audience. The APEC Discussion Series at the Precinct was launched in May and gives Papua New Guineans unprecedented access to visiting international experts and the APEC discussions taking place throughout 2018. Thursday’s discussion was the second in the series, which is held at the University of Papua New Guinea, and the events will continue each month until November. 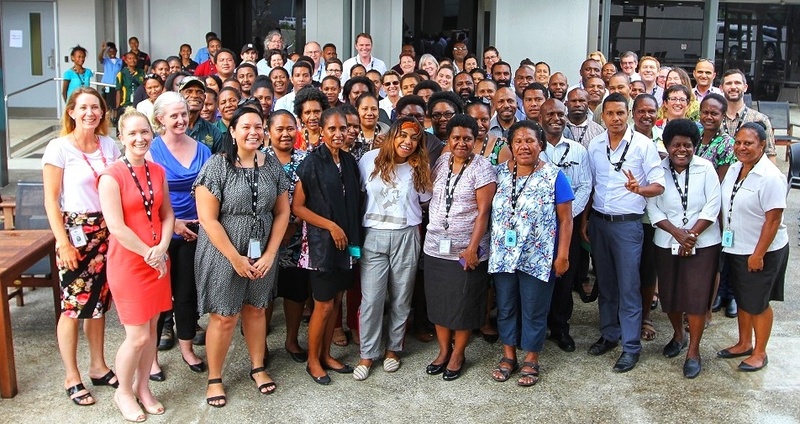 The series is hosted by the PNG APEC Secretariat and the Pacific Leadership and Governance Precinct, supported by the PNG – Australia Partnership, and explores APEC themes and policy issues relevant to Papua New Guinea and the Pacific. As the 2018 APEC host, Papua New Guinea will hold approximately 200 meetings with up to 15,000 delegates, including global business and government leaders, policy and technical experts and academics. 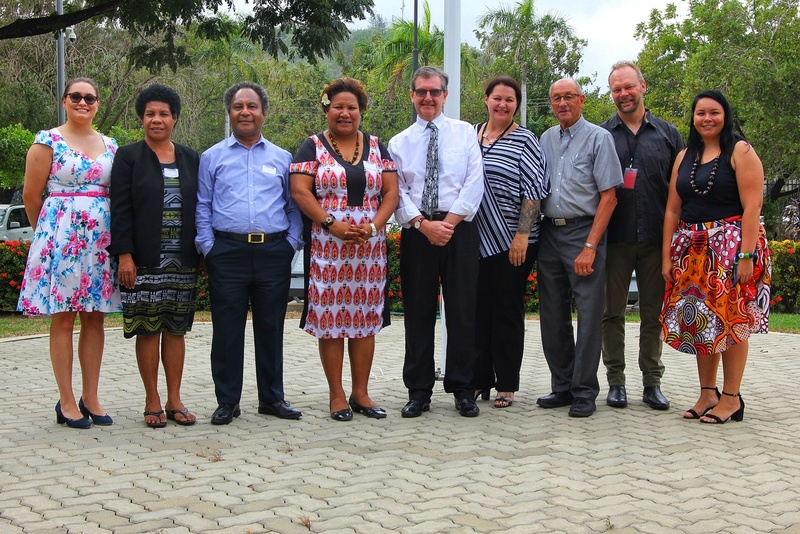 The Pacific Leadership and Governance Precinct is a partnership between Papua New Guinea and Australia to support the development of ethical and capable leaders. The strength of the Papua New Guinea – Australia partnership was demonstrated further this week with the signing of a memorandum of understanding for a trilateral project to deliver the Coral Sea Cable System. The three Prime Ministers from Papua New Guinea, Solomon Islands and Australia led the signing event. In Port Moresby today a subsidiary arrangement was also signed. The Coral Sea Cable System is a showcase of how Papua New Guinea and Australia continue to enhance our bilateral ties and common interests through transformative projects. 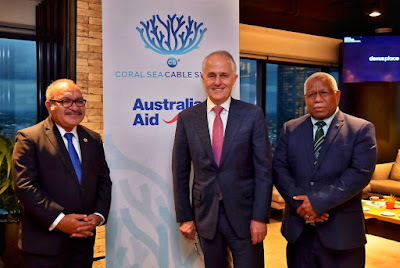 The new cable system will better connect Papua New Guinea, the Solomon Islands and Australia through the installation of undersea telecommunication cables. 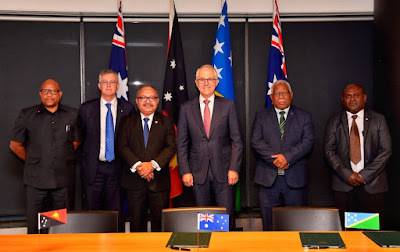 The project will enable high-speed internet capability to Papua New Guinea, resulting in significant improvements to internet reliability and quality. The new system will enable local businesses to access new opportunities in the region and globally, and provide opportunities to leverage technology to deliver improved government services. 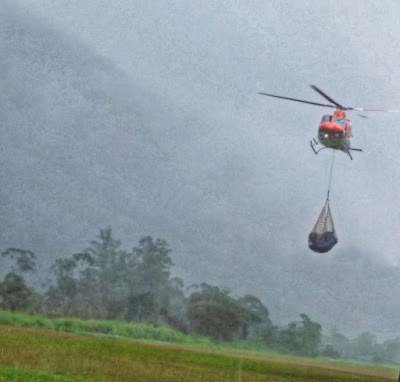 This will result in substantial economic and development opportunities for Papua New Guinea. At the signing event in Port Moresby to confirm arrangements with the Department of National Planning and Monitoring, Australia’s High Commissioner to Papua New Guinea, Bruce Davis said that Australia is proud to be partnering with Papua New Guinea on this exciting project. Davis went on to say that “the new cable system underscores Papua New Guinea’s efforts to promote economic integration in the Pacific in its 2018 APEC host year, and to foster domestic growth opportunities". Australia will fund the majority of the project, with Papua New Guinea to provide an important co-contribution. Solomon Islands will also provide a contribution as a partner in this trilateral project. The Australian High Commission in Port Moresby is hosting a special programme of events through to Thursday July 19 in celebration of the National Aborigines and Islanders Day Observance Committee or NAIDOC Week. 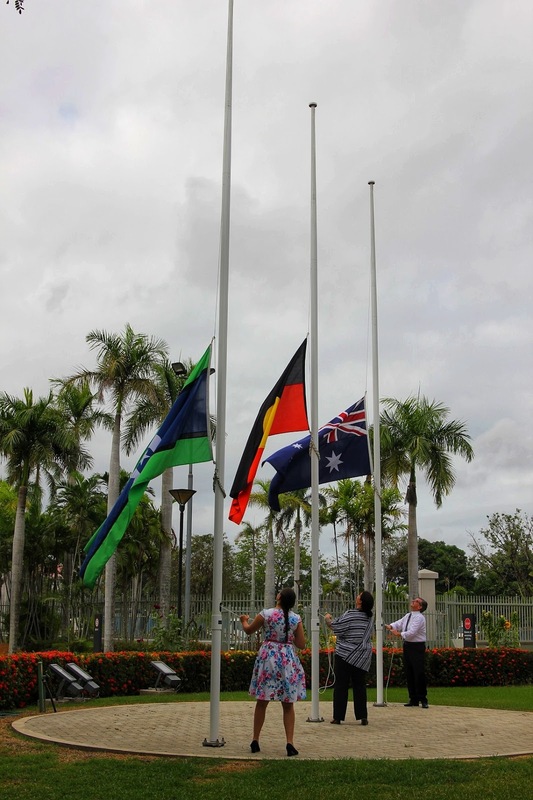 The programme began on Monday July 9 with a ceremony at the High Commission to raise the Aboriginal and Torres Strait Islander flags alongside the Australian flag. Raising of the flags: Australian High Commission second secretary Yasmine Davis raising the Torres Strait Islander flag, chief executive officer of Indigenous Community Volunteers Stephanie Harvey raising the Aboriginal flag and Australian High Commissioner Bruce Davis raising the Australian flag. This year two exceptional indigenous Australian women have been invited to participate in the programme – Stephanie Harvey, chief executive officer of Indigenous Community Volunteers and rising star in the music industry, Emily Wurramara. The two week programme includes the formalisation of a partnership between Papua New Guinea’s National Volunteer Service and Indigenous Community Volunteers and a creative collaboration between Emily Wurramara and Papua New Guinea’s top female artist, Mereani Masani, which includes performing for and mentoring youth in performance skills. Australian High Commission second secretary Yasmine Davis, National Volunteer Service acting executive director Molly Willie, National Volunteer Service council chairman Bernard Maladina, Secretary for Department of Youth Religion and Community Development Anna Solomon, Australian High Commissioner Bruce Davis, chief executive officer of Indigenous Community Volunteers (ICV); Stephanie Harvey, co-chairman of ICV Board Bill Edwards, ICV general manager for business development and innovation Tom Layton and Australian High Commission second secretary; Jacqueline Herbert. NAIDOC Week first emerged in the 1920s when Aboriginal groups sought to increase awareness on the status and treatment of indigenous Australians. This year’s NAIDOC Week theme ‘Because Of Her, We Can!’ celebrates the important role that women have played, and continue to play, as active and significant role models at all levels of society. The Royal Papua New Guinea Constabulary is boosting its efforts to crack down on financial crimes in Papua New Guinea. By the end of the year, almost 80 police officers will have received specialist training in investigation and prosecution of fraud and corruption. 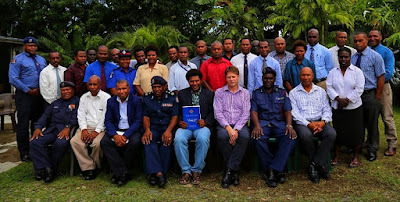 East New Britain Deputy Governor Cosmas Bauk (centre, front row) and RPNGC Assistant Commissioner, Island Region, Anton Billie (fourth from left) join instructors and participants at the commencement of the Fraud and Corruption Investigation training, in Kokopo, East New Britain. The RPNGC Fraud and Anti-Corruption Directorate is conducting the Fraud Investigations and Prosecutions course nationally. The training was held for 28 officers from the New Guinea Islands Region in Kokopo, East New Britain, recently. The training will strengthen the capacity of these officers to investigate and prosecute complex fraud and related matters in a coordinated way. This is the second group of officers to undergo this training, following one conducted in March for 29 officers from the Southern Region in Port Moresby. Course Instructor, Chief Sergeant Kila Guma said the training significantly increases the effectiveness of police in detecting, investigating and prosecuting fraud, corruption and similar crimes. “This course is very important. He added that by bringing investigators and prosecutors together in the same room, the training will foster mutual understanding and teamwork in the successful prosecution of offenders. The course covers practical issues such as investigation planning and management, as well as interactive sessions on elements of offences, file preparation and evidence. Participants will also receive training on the recent legislation concerning money laundering and the proceeds of crime, which is essential to combatting increasingly complex financial crimes. Senior Constable Tina Nikints, a fraud investigator based in East New Britain, said the training was “something I have been longing for”. “When I started in the Fraud and Anti-corruption Unit I didn’t have any formal training. 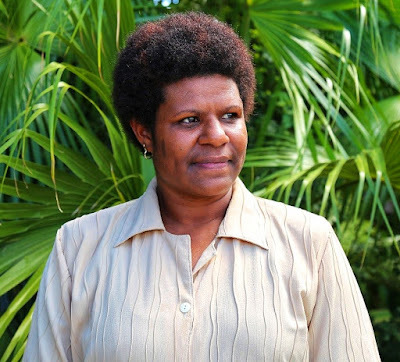 Senior Constable Felicitas Mare, a police prosecutor based in West New Britain, said the course, which covers the latest trends and techniques, would lead to more effective and efficient investigations and prosecutions. “After this course I will really know how to deal with fraud matters and I am pleased,” Senior Constable Mare said. 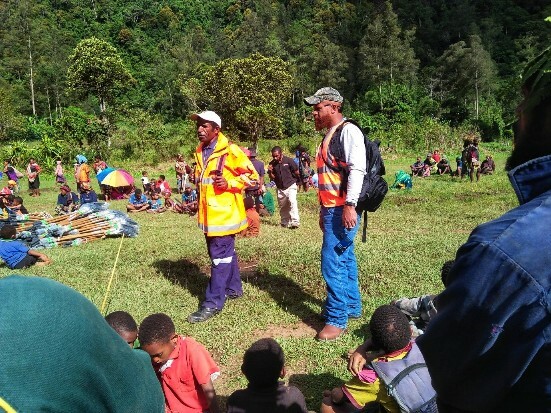 Plans are in place to conduct the next training in Mt Hagen for officers based in the Highlands region. This initiative is supported by the Australian Government through the Justice Services and Stability for Development Program. The distribution has reached more than 900 household of communities living along the Pipeline Right of Way (ROW) at Benaria areas including Yarale, Timu, Lau, Benaria, Mulako Tangi, Tamita and Pakale. Other distribution sites around Hides include the well pads, 3 Ways, Nigiria, Perapu and Kulu communities. The villages are very remote and surrounded by mountains. 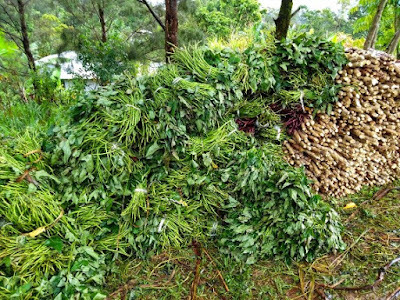 The communities are mostly subsistence farmers, producing crops such as banana, sweet potato, cassava, pumpkin, peanuts and corn which were destroyed by the earthquake. of new born care to ensure they survive and thrive. 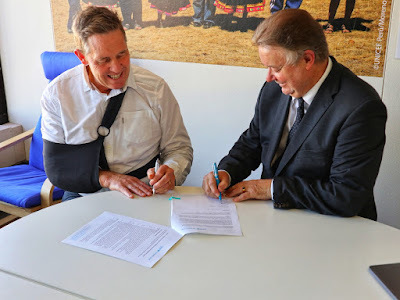 Tony Stuart, Chief Executive Officer UNICEF Australia and David Mcloughlin, Country Representative UNICEF PNG during the signing of the LOE in Sydney Australia, yesterday. This follows the approval of a generous funding support of over K2 million (USD 642,600) by UNICEF Australia to support the roll out of an Early Essential Newborn Care (EENC) programme with a focus on preventing and managing neonatal hypothermia (low body temperature) through the use of an innovative hypothermia alert device known locally as the Bebi Kol Kilok. In Papua New Guinea, up to6,000.newborns or six out of every 10 infants die every year from preventable causes, a rate that has not improved in the last 20 years and is also the highest in the region. Correct hypothermia management can save almost half of these deaths. “UNICEF PNG is very grateful for this donation that will support the Government of PNG to reduce neonatal deaths by promoting simple cost effective and life-saving practices that are crucial for newborns to survive during the first month of life,” said UNICEF Representative, David Mcloughlin, at the signing of the programme in Sydney, Australia yesterday. the baby’s most vulnerable period in the first month of life. The funding support will enable UNICEF PNG to work with the Government to strengthen local capacity in hospitals and health facilities deliver the package of newborn care, assess and remove bottlenecks in the delivery of newborn care services and empower communities with the necessary skills and knowledge to continue newborn care at home. organisations to promote the implementation of this programme. 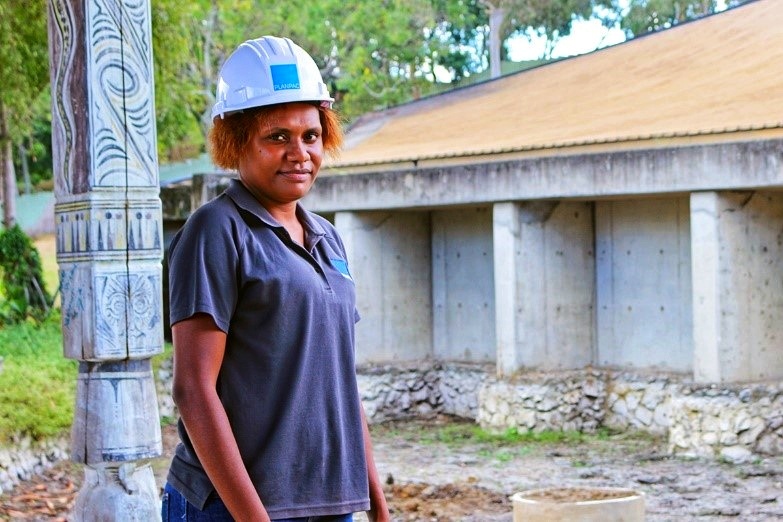 Stephanie Korokoro is building her career as a young architect by working on major construction projects supported by the Australian Government in Papua New Guinea. Stephanie Korokoro on the National Museum and Art Gallery refurbishment construction site in Port Moresby. A recent architecture graduate, Stephanie is a key member of the Planpac construction management team engaged to undertake refurbishment of the National Museum and Art Gallery (NMAG) in Port Moresby. “The museum building is of great national significance to Papua New Guineans as it conserves and displays to the world our country’s rich and diverse culture and history,” said Stephanie. Originally from Bougainville and the eldest of eight children, Stephanie says her parents made sure both girls and boys in her family were given equal access to education, and were encouraged to pursue their passions. In 2013, Stephanie obtained a degree in architecture from the University of Technology in Lae following a childhood interest in building design. “I’ve always enjoyed designing and constructing my own DIY projects,” recalls Stephanie. Stephanie scored her first big construction project in 2015 after being with Planpac less than a year. Appointed as part of the construction management team on the Arawa Hospital upgrade, she was responsible for overseeing 50 construction workers across the site – predominantly men. Despite finding the project a challenge in the beginning, she learned how to gain the trust of the men reporting to her after seeking advice from her father. “Taking my dad’s advice, I started volunteering on site to help the men out with bits and pieces, such as mixing cement for the floor slabs and helping to weld. "Eventually the men realised that I was not an outsider and not only there to give out orders, but rather a team player working with them to deliver the project. As Stephanie gains experience on different construction projects, she is also looking to the future. In the next five years, she hopes to register as a licensed architect and pursue a degree in construction management, while helping other women aspiring to work in the same field. The NMAG refurbishment and Arawa Hospital upgrade projects are supported by the Australian Government in partnership with the Government of Papua New Guinea through the Decentralisation and Citizen Participation and the Bougainville Partnerships respectively. Both Governments are committed to mainstreaming gender equity and social inclusion across all aspects of Papua New Guinea’s development as reflected in Vision 2050. Churches are joining forces to address sorcery accusation-related violence as part of a national effort to stamp out such attacks. Church leaders discuss sorcery accusation-related violence in their province at the recent workshop. 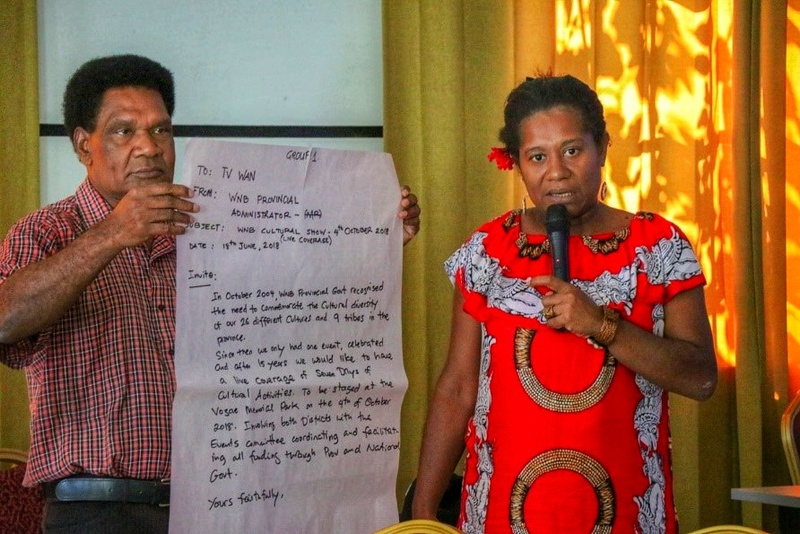 Almost 50 leaders from 14 denominations in the Momase region have contributed to the development of a national church strategy to tackle sorcery accusation-related violence following a workshop in Lae by the Constitutional and Law Reform Commission (CLRC). CLRC Secretary Dr Eric Kwa has condemned sorcery accusation-related violence, saying it is usually directed against isolated and vulnerable people in the community, particularly women. Dr Kwa said the three-day workshop was the first of a series of regional consultations to be held around the country to aid the development of a National Churches Strategic Plan on Sorcery Beliefs and Sorcery Accusation-Related Violence. The National Churches Strategic Plan is a key component of the Sorcery National Action Plan, which aims to break the link between accusations of sorcery and violence. 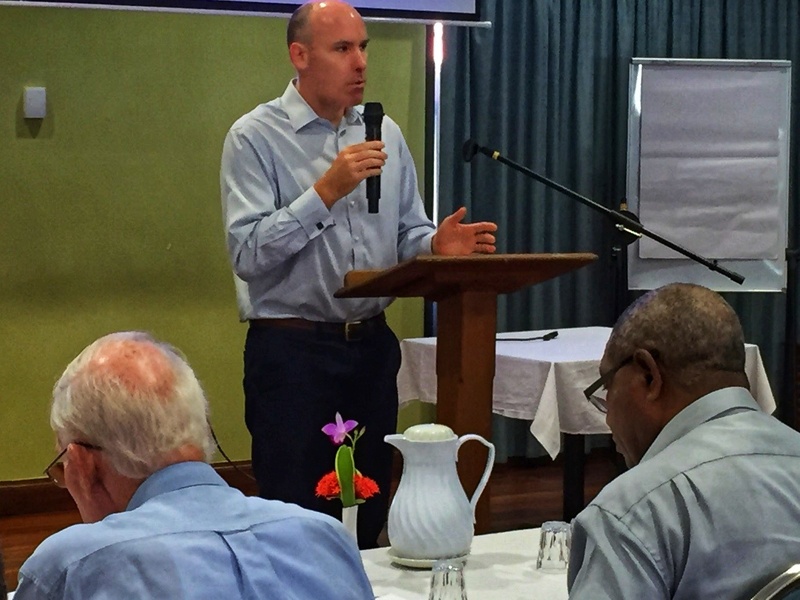 Addressing the meeting, Australian High Commission Minister Counsellor Andrew Egan said churches had a crucial role in reducing and eventually eliminating the incidence of sorcery accusation-related attacks. “Because of their deep roots in the community and their strong connection with people in their everyday lives, churches are in a unique position to help address sorcery accusation related violence,” Mr Egan said. The National Churches Strategic Plan is being developed to help ensure churches act and speak against sorcery accusation-related violence in a consistent and coordinated way. The workshop was organised by the CLRC with support from the Department for Community Development and Religion, the PNG Council of Churches and the Australian Government through the Justice Services and Stability for Development Program. 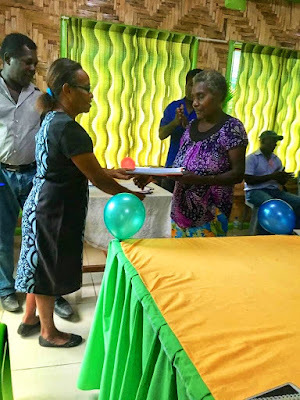 Nine community grants worth up to K100,000 each were signed on Friday July 6 in Arawa in the Autonomous Region of Bougainville to support grass-roots development projects. The grants will fund water and sanitation, road, child counselling and farming projects based in Central and South Bougainville including Bana, Buin, Kieta, Siwai, Panguna and Torokina. Grant recipients include Pakana Clan Group, St Chris Sipii Primary School, Lenoke Council of Elders, Bogisago Womens Group, Pewana Village Water Sanitation and Hygiene Project, Konga Primary School-Bom, Baitoningka Road Project, John Roka Memorial School, Ukoto Womens Group. Secretary for Community Development, Mana Kakarouts, presenting the community grant to Ukoto Women’s Group chair, Ursular Ririuvie. 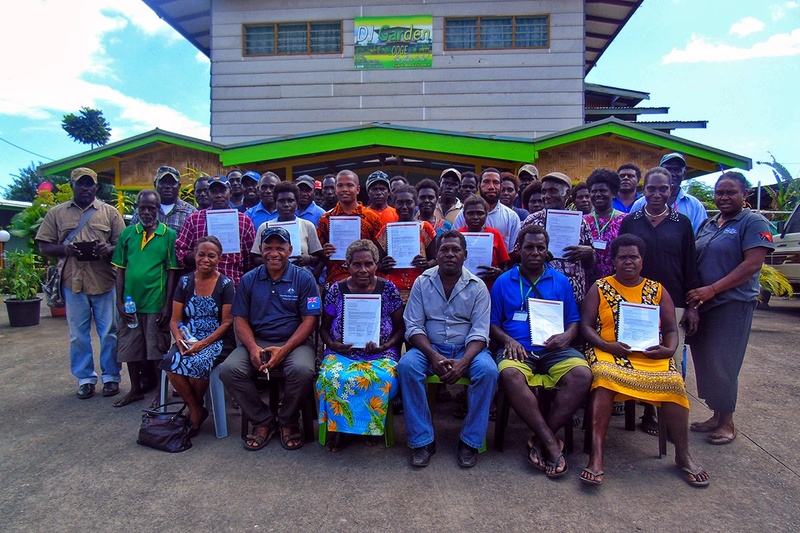 The projects are supported through Bougainville Community Grants scheme, a partnership between the Autonomous Bougainville Government (ABG) and Australia. 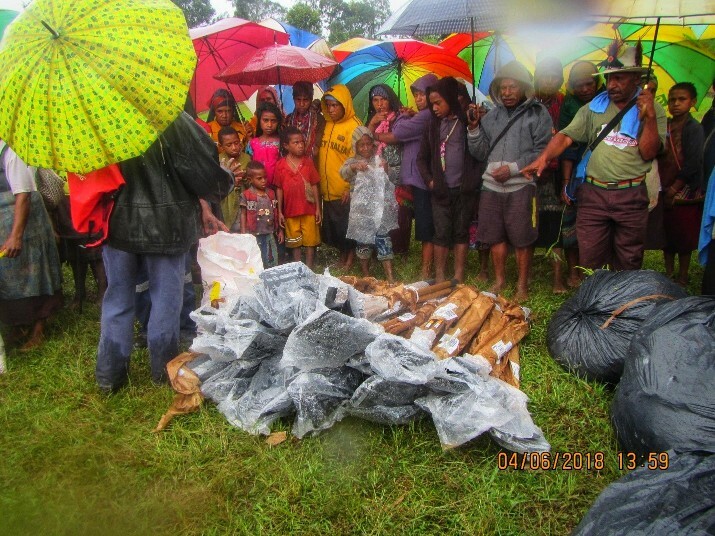 Grants of between K5,000 and K100,000 are available to groups and organisations across Bougainville to support community-driven development activities that promote peace, security and cohesion. Community grants provide funds for projects of four to six months’ duration in the areas of water, sanitation and hygiene, income generation and livelihoods, gender equality and social inclusion and climate change adaptation. Baitoningka Road Project Chairman, Mark Marina’a, signs the grant agreement with Grants Officer, Andrew Bosna, as witness. In November 2016, expressions of interest were invited and a total of 329 applications were received, with 60 projects selected so far by the scheme’s committee and 30 currently under implementation. 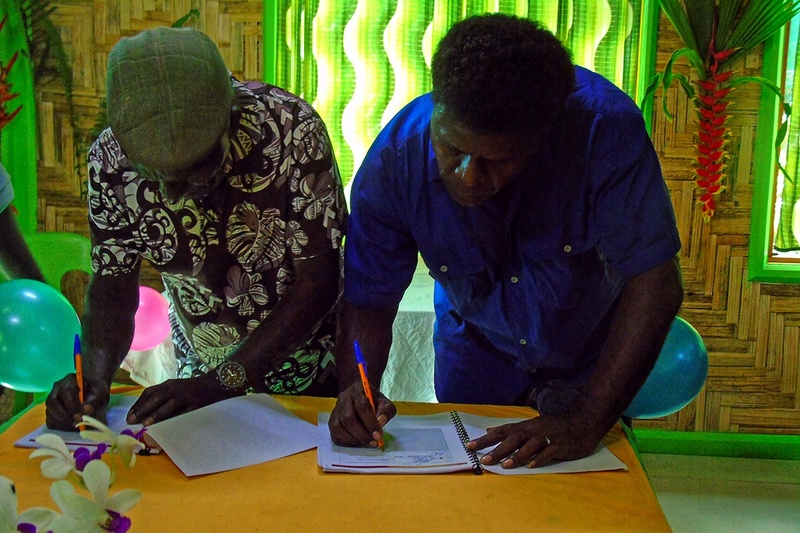 Grantees are selected by the Bougainville Community Grants Committee, which is chaired by the ABG’s Secretary of Community Development and includes members from seven ABG departments and community representatives. Projects chosen for grants funding must demonstrate partnerships between government, citizens, landowners, community-based organisations or businesses who share the responsibility of addressing local development challenges. 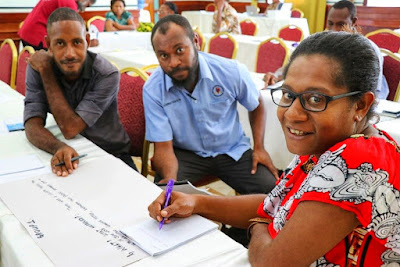 Forty-five women and men from Talasea District in West New Britain Province participated in media training last month to understand the role of media and how it can be used as a platform for communicating their stories and discussing important national issues. Emma Dimain, Pius Vapolo, Emmanuel Mockley, Marsall Sangsangio and Roselyn Akua during a group session on basic news writing skills in Talasea. The two-day workshop was held in Kimbe by the Media Development Initiative (MDI), covering basic news writing, setting up and participating in news interviews, social media literacy and understanding the power of media to shape public debate. The training was aimed at teaching ordinary citizens how to use media as a means to communicate their stories and express their views to others, including the government, to influence positive change. 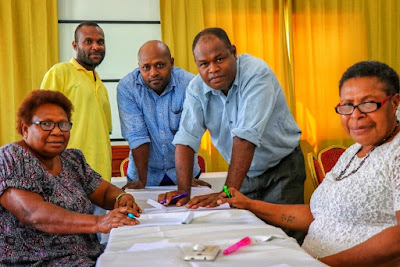 Women in Business representative, Cheryl Kisakiu was one of 45 participants who received media training in Talasea from the Australian-supported Media Development Initiative. 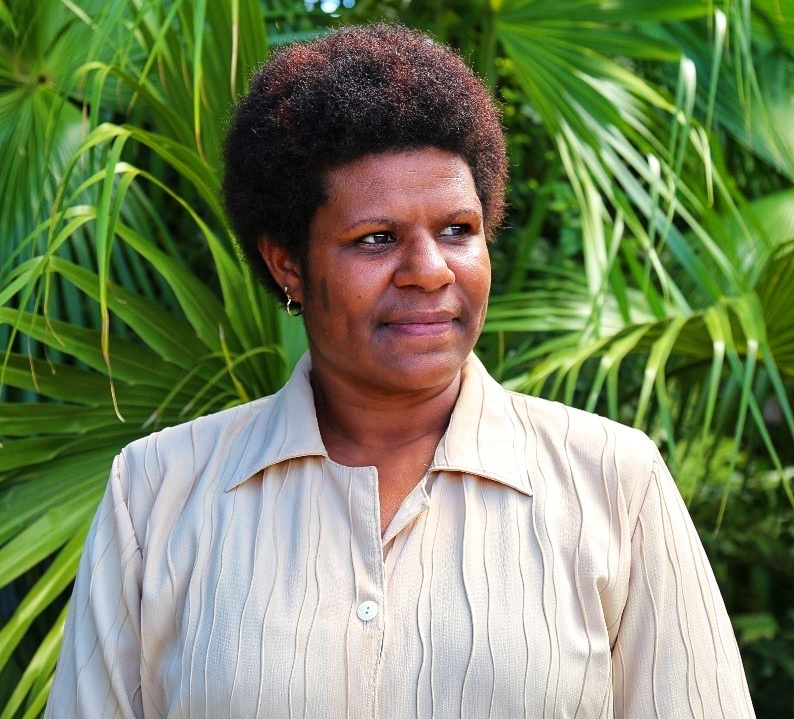 Equipped with basic skills to write a media release, Program Coordinator for West New Britain Human Development Institute, Vince Marinduo, said she can now share her program’s success stories – such as training more than 7,000 people in business viability programs in the province – to a wider audience. “I believe positive change stories, promoted through local media, can promote financial literacy and encourage economic viability in the district and province,” said Ms Marinduo. The MDI aims to support Papua New Guinea media organisations to facilitate the flow of information between citizens and government and educate civil society organisations about ways of using the media as a platform for communicating their stories and engaging with government. MDI provides technical assistance and mentoring through three hubs – the District, Current Affairs and Creative hubs. The hubs aim to promote creativity, innovation and networking among members to build and strengthen relationships between the state and citizens through the media. 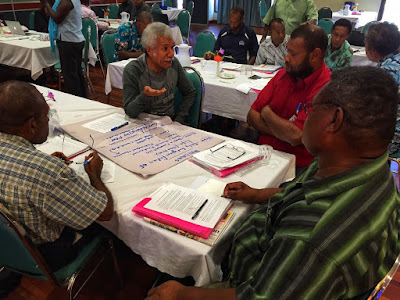 Hub members include subject experts such as script writers and film makers, community members, local community based organisations, local government and media organisations such as the PNG Media Council, NBC and others. Cheryl Kisakiu takes part in a group exercise during media training in Talasea. MDI is trialling a district hub in Talasea to increase understanding of the role of media and how ordinary citizens can effectively shape and influence change in their communities. Supported by Australia through the Decentralisation and Citizen Participation Partnership, MDI is managed by Australian Broadcasting Corporation International Development in partnership with Papua New Guinea National Broadcasting Corporation (NBC) and other media organisations to build capacity, develop quality content and facilitate platforms for citizens and state to discuss issues of national interest.